ConfiAd Color Adhesive is a two-component based on acrylic resin containing a modified special epoxy resin for bonding of natural stone and engineered stones. Combined at a 10:1 ratio, it has a working time of 5 to10minutes and fixture time of 20 to 25minutes. ConfiAd Color Adhesive is available in off-white and is supplied in ready to 250㎖ cartridges as a non-sagging gel. ConfiAd Color Adhesive is flammable and can be dangerous if used improperly. Keep containers closed after use. Wear gloves and safety glasses to avoid skin and eye contact. Wash with soap and water after skin contact. In case of eye contact, flush with water for 15 minutes and get medical attention. Harmful if swallowed. Keep out of reach of children. Keep away from heat, sparks, and open flames. Reference the Material Safety Data Sheet (MSDS) for more complete safety information. ConfiAd Color Adhesive may be applied manually or with automated equipment. To assure maximum bond strength, stones must be mated within the specified working time. Use sufficient material to ensure the joint is completely filled when parts are mated and clamped. Clean up is the easiest before the adhesive has cure. Application of adhesive at temperatures between 18℃ and 26℃ will ensure proper cure. Temperatures below 18℃ will slow cure speed; above 26℃ will increase cure speed. Long term exposure above 26℃ will reduce the shelf life of these materials. 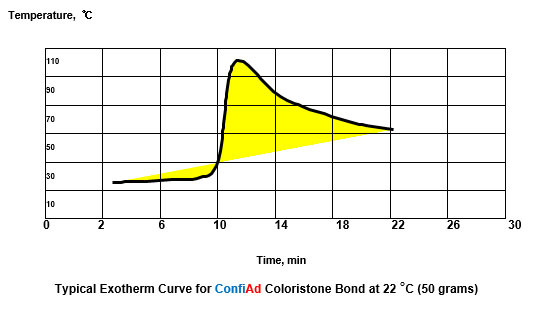 Prolonged exposure of hardener above 40℃ quickly diminishes the reactivity of the product and should be avoided. Refrigeration is an acceptable means to increase shelf life, however freezing should be prevented. For expiry date see label. ConfiAd Color Adhesive in the normal conditions to determine suitability. usable. Times presented were tested at 22℃. chemical resistance listed assume long term exposures at ambient conditions. will be used, and to determine the suitability of the adhesive for the intended purpose. can not accept liability for results obtained.